Combining "OU* VOICE" and "FEDERATION REPORTEt"
1 conference opens, the main new.". Dayan, at the Cabinet session. vr. Dennis Tartakow. co-chairman, and Dr. Arthur Virshup. ments of the people there. visiting journalists and for peace. in the process of being mailed. Gifts Division ($5,000 and over). 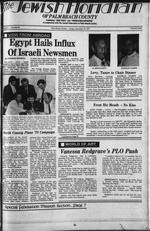 Airport upon Sadat's arrival in Israel the night of Nov. 19? Prime Minister and giving her what looked like a quick smooch. kissed her, I would not have been ashamed of it." "She told me Israel has no right to exist,"
million for Israel, was stunned. racist, fascist state and it has to go." general meeting on Monday, Dec.
Temple Emeth took place Nov.
honored The Rev. Dr. William W.
Thursday, Dec. 22 at 12:30 p.m.
bers will meet Wednesday, Dec.
Dec. 24 at 8:30 a.m.
Delray Beach, Dec. 16 to 18. Ion the road to a "comprehensive"
Indicated he does not favor it. later date it becomes obvious"
Hussein of Jordan, Carter said. speaking for the Arab world." first act on arriving in Germany. were present during his visit. Afternoon Progfam: 12 noon3 p.m.
go to the meeting along with Egypt and Israel. step after Cairo is the Geneva conference. Which has been trying to wreck the Sadat initiatives? have a role in the Middle East if peace were established." Lebanon to go to Cairo. of State for Political Affairs. State Department 12 years ago. How Dare They Make Peace? through their export oil policies. back to Tallahassee next week. hearing from some alert reader). won't have to suffer in that area. can party and the Puritan ethic. Southern Baptist though he is. want to bet against him. make men and nations civilized. a constant in human conduct. often cruel, and rarely logical. urvival of the nation. We. Minding. At the same time. sigent elements within the area. with a sense for their limits. stantly in the affairs of the area. stone ot the prospects of peace. and commitment of the parties. will be dedicated and committed. FILTER- 10 mg.'iw". 0.7 mg. nicotw. MENTHOL 11 mg "lar". 0.7 mg. nicoiint. v. ptt agmtM. FTC Rtport DEC. '76; FILTER 100's. 11 mg. "Mi". 0 9 mg nicot** r on ctgirn by FTC iMihod. grate to Israel with his mother. beds they are tied to ... "
the Zionist movement in Israel?" "This time, it was different,"
"THERE IS no doubt." Dr.
in a morally responsible fashion." American Zionist Federation. Inc.. Women's American OHT. Health Ministry, referred to Dr.
resents a positive step, he said. practice and get people released." the political system are strange. lems or were themselves arrested. situation. He took serious risks. favorable in terms of climate." will be visiting the Palm Beach area the week of December 18th. certs in both Temple Beth El and Congregation Anshei Sholora. Call CHUCK lor prompt fast service. PALM BEACH ... ISRAEL ... PALM e_n ... ikmki- ...r~i* . right! Mr. and Mrs. Seymour Fine, Mr. and Mrs. Victor Ratner. Mr. and Mrs.
Weingard, Mrs. Rubin, and Earl Helman. due to a lack of funds. |Mfty traveled to Israel. Pictured fl6 "
Blau and Zviha, their guide. need for a "strong State of Israel. to be proud of their heritage. all need to go ... we mast go." and time will be announced. many trades taught to students. Fence" at the Lebanese border. Israefs youth, their "greatest natural resource." h J&r ss^tsrrt ^r** "****. sponsorship of a cousin there. where Fine's father was born. there in the last 30 yiars. Sea, and went to Masada. capable planning of this mission. Carol Rosenblatt (center), owner of a restaurant in 1_. g business!!. Can you imagine Sadat dropping in for a milkshake! :: charity but joint interest. $ Thank you again, and please give my regards to all. the "Sister-City" with Palm Beach County. USE THIS HAHDY ORDER FORM. been not to accept this "infidel,"
enclave in an Arab world. destruction of the State of Israel. the world is to survive. forum for whoever "will come." which all negotiations must flow. it now that it is their turn at bat? call it that all the more absurd. station WEVD in New York City. two daughters. Adena and Leah. stage in the final war. insist they will not tolerate it. in our high falutin' ideali. the umpires off the field. parent. But us? We need o.
I 515 N.E. 20th St.
FLRAn 2m ?,l^!^iNFESTAT'0N 0F F>-EAS THIS YEAR. DrKn^TFrLtLAS IS N0 JGB F0R AN AMATEUR. grams for children of all ages. liisi' on the Loxahatchee River. ng lunch and drink every day. sota. Swim in the Gulf at St.
ren Stone and Debbie Priess. Kfram time is 3 p.m.
unced here by Rabbi Joseph H.
sports program for the JCC. principal is Dr. Avie Waxman. tration is required for all classes. Wednesday at 11:15 to 1:15 p.m.
Enrichment Series with Dr. R.
The next film will be "Mr.
ning the second week in January. doctor. The class begins Jan. 9.
and ask for Bonnie Silverstein. money will go to the JCC. ning on Jan. 17 from 1 to 3 p.m.
socialization will begin Jan. 8.
imprint on the Jewish calendar. the Rabbinical Council for 1978. Rabbinical Council is Rabbi Dr.
Jacob, and all his seed with him" (Gen. 46.6). many other nations of its era. feeling that the shape of futur*. Saturday 8:30a.m., 5 p.m. . Blvd., North Palm Beach, Fla.
p.m. Saturday at 9 a.m.
Daily minyons at 8:45 a.m.
CJ Room 12, Boca Raton, Fla.
[the Jewish Federation of Palm Beach County. HE SAID the "positive voice"
that had to be solved. was the Arab boycott of Israel. he headed the British "wanted"
road to peace with the Arabs. gentine citizens will be tenuous,"
the initial stages, they say. will take place in Jerusalem Feb.
ist groups are eligible to vote. B'nai B'rith Women Naomi 12:30p.m. Hadassah Palm Beach Tikvah 12:30 p. m.
Jewish Family and Children's Service 7:30 p.m.
Temple Emanu-EI Sisterhood 12:30 p.m.
B'nai B'rith Women Tzedakah Board 8 p.m.
Hadassah Henrietta Szold -1 p.m.
Jewish Wor Veterans Auxiliary 408- 1 p.m.
Temple Beth-El Sisterhood 8 p.m.
Temple Israel Board 8 p.m.
Jewish War Veteran's Auxiliary 408 1 p.m.
Temple Beth Sholom Sisterhood Board 10:15 a.m.
B'nai B'rith Women Boynton Board 1 p.m.
B'nai B'rith Women Naomi Board 1 p.m.
Congregation Anshei Sholom 1 p.m.
Women's American ORT Delray 12:30 p. m.
2 SHOWS NIGHTLY at 8 p.m. and 10 p.m.
Showtime 9:15 p.m. to 10:15 p.m.